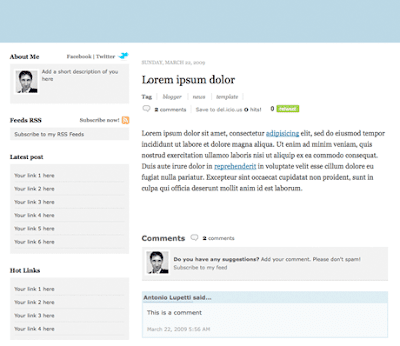 A clean, fresh professional looking and free Blogger Template is now available for download. This template is known as “Typoork” released by Antonio Lupetti, Engineer, Pro Blogger, Mac user, Web addicted from Rome, ITALY. Typoork template is totally free and highly customizable. It supports inline comments form, save to delicious and retweet counters in each post. The retweet counters are good to show the popularity of your posts in Twitter sphere when someone tweets any of your posts in the big Twitter community. From Antonio Lupetti’s blogspot (Woork), he provides users with HTML instead of XML code because this is what you can modify the template simpler if you use an wysiwyg like Dreamweaver.